A 16th century tower house, in Aberdeenshire, remodelled as fortified military barracks with star-shaped wall in 1748. Restored interior of 200 years ago has musket recesses, wide wooden bunks and large stone fireplaces. 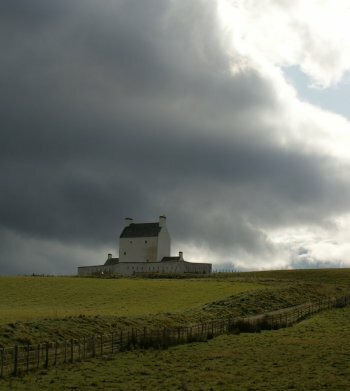 Corgarff Castle was built about 1530 by the Elphinstone family (who also owned Venlaw Castle, among others) and leased to the Forbes. The Forbes fueded with the Gordons, and the castle was nearly burned to the ground in 1571, killing Margaret Forbes and 26 retainers and servants. The attackers removed the wall stones that closed off the bottom of the latrine chutes and lit them on fire, which burned the entire castle. The Erskine Earls then aquired the property in 1626, and it was used as a mustering point by the Marquis of Montrose for his campaign of 1645. Montrose made a wide swath through the scottish Castles, including Huntly Castle and Ardvreck Castle before being drawn and quartered in Edinburgh. Corgarff was burnt (again!) by Jacobites in 1689 to deny its use to the government, and once more in 1716. Apparently sitting on a high hill rendered is less susceptible to cannonfire and ballistas. The Jacobites used it during the Rising of 1745, this time the Forbes were forfeited and the castle fell into crown hands. In 1748, the government bought Corgarff and altered the buildings, with the addition of the star shaped outworks, which were supremely suited to defense. There is no part of the outer wall which is not covered by two angles of fire. The castle was later used as a base to help stop illicit whisky distilling. The floors are restored as they would have been used for a garrison, including some artistic license in adding graffiti that might have been there. When we visited, the castle was heated with authentic peat fires. I had a headache for hours. The last occupants of Corgarff were two old women in 1890s. It was restored in 1960 and handed to Historic Scotland for maintenance. The main tower is a 16th century tower house, rectangular in plan, with four stories. Corgarff was modified by the government afte rthe 2nd Jacobite rising, adding a single story builing to each end, and building the star shaped wall, dotted with vertical gunloops. It sits on a long rise, approached by a single road to guard the River Dee.